Mother Nature is awesome in many ways. The mind-boggling forces involved that create the unique color combinations, striations, and inter-mingling of minerals with rock are incomparable and beautiful! If you have any of the following questions about granite, stay tuned… because I’ve got the answers for you! It’s amazing to have the opportunity to see, firsthand, hundreds of types of exotic and classic granite slabs waiting to be shipped to fabricators to be honed into granite kitchen countertops and islands. I am lucky enough to have had that opportunity — because there’s a granite slabs wholesaler located next door to where I’m currently working. Being a big fan of unique, high quality homebuilding materials, I just had to make my way to their door and get to know the folks who work there. With camera and notepad in hand, I went a knockin’ and I’ve made a few friends in the granite slabs business! 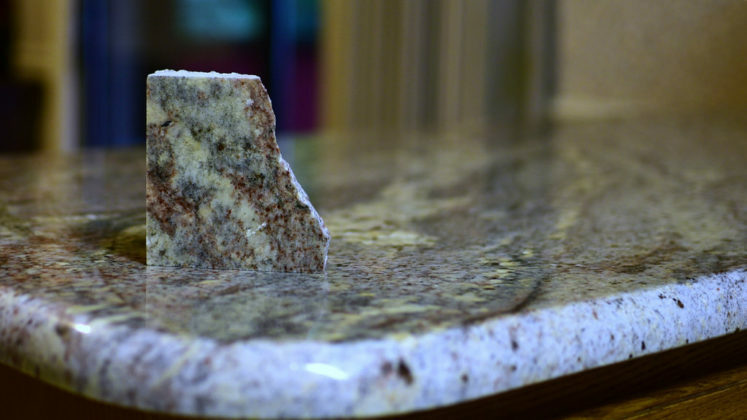 M&F Granite is one of a handful of import wholesalers of exotic and classic granite slabs in the Atlanta area — but they have a great (direct) source that sets them apart from other wholesalers. They also import onyx, travertine, polished sandstone, quartzite, and marble slabs from various countries. Jeremy has been in the granite slabs business for well over a decade. He can point out even the smallest imperfection in any slab — if there is one. Both gentlemen are very informative about the whole granite slabs process — so I feel fortunate to have met them. I learned that 90% of the material at M&F Granite is imported from Brazil. They also import from Italy, Spain, China, and India. Most of the marble comes out of Italy — and it is spectacular. The onyx from Italy is incredible, too. Seeing these products firsthand has been a real treat for me! 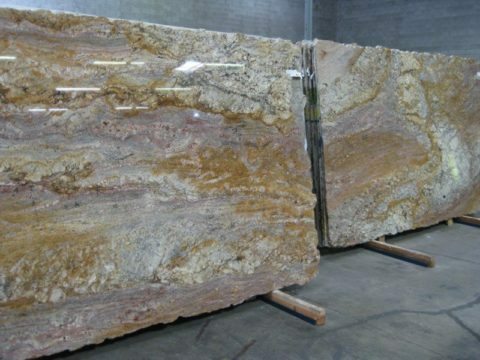 Brazil supplies the majority of the granite slabs. The majority of the marble originates out of Italy — as does Onyx. However, marble also comes from Spain. China has a unique supply of brown granite that is popular among homeowners. It takes a total of about 30 days for the rock to go from where it has been for an eternity to the doorstep of the wholesaler. It takes about 24 to 48 hours to slice one huge block into individual slabs of granite with gang saws. It then takes about 2 days to apply the resin and cure it in the oven. The remainder of the time is spent getting the granite slabs to market. The process of mining the rock and bringing it to market is complex. Luckily, M&F Granite has an interesting video that shows the entire process within approximately 6 minutes. The video is eye-opening and down to business. I noticed that some of the more exotic-looking materials (such as onyx) and some of the rare granite slabs had a plastic mesh adhered to the entire reverse side with an adhesive. It’s there to simply reinforce some of the more delicate and exotic slabs — to keep them intact. I’ll give you a little bit of background on my fixation on beautiful rocks and minerals — so you’ll have a better understanding of why I’m amazed by the entire process of turning granite slabs into countertops. After visiting my brother at Pease AFB when I was 16, I lugged over 40 pounds of rocks home in a suitcase. I found those rocks on Mt. Washington. A flint rock the size of a softball that was collected by my grandfather in Ohio 50+ years ago and given to me by my mom. I understand that it is illegal to collect flint from that area now. A pink marble chunk from the Pink Palace estate of Sam Tate. A white marble chunk from a marble mining company in Tate, GA.
A few different, cool looking granite rocks from Lost Mountain — just down the road from where I live. My yard also has a few large, very interesting quartz rocks that were there when I bought the house.